David Goffin returns the ball to his opponent, Joao Sousa, during a tennis match on Sept 21, 2014, in France. At a recent practice in Mons, Belgium, the country’s former leading man and its current top tennis player traded missiles from the baseline. Olivier Rochus grunted as he leapt into his classical one-handed backhand, while David Goffin quietly parried with groundstrokes into the corners. Goffin won most of the exchanges, and all 10 of the games. Rochus showed his frustration after it was done by sending a ball into the stands at the Lotto Mons Expo, where Belgium’s biggest men’s tennis tournament is taking place this week. But in a court-side interview afterwards, Rochus, who is 33 and retiring after this tournament, pointed out that he is in good company. “When my opponent is way better, what can you say? … It’s not only tough for me, it’s tough for everybody. I’m not the only one losing,” he said. Just about everyone is losing to the 23-year-old Goffin these days. From the start of July to the start of this tournament, Goffin won 34 of 36 matches, including the first 25, improving his ranking from 106th in the world to No. 31. In his 34 wins, he lost just four sets, and has been forced into just five tiebreakers. The rest of the sets he won decisively, seven by 6-0 and 11 by 6-1. Goffin’s glorious two and a half months had yielded nearly as much success as he had achieved in his prior four years as a pro. He’s won 17 tour-level matches and roughly $340,000 in earnings, increasing his career totals by about a half and a third, respectively. 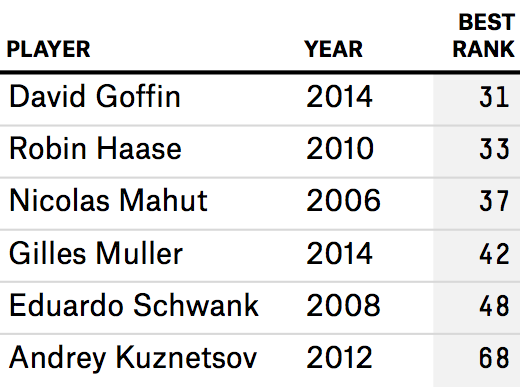 Goffin’s winning run is only matched in the last decade by the players who have been No. 1 during that time: Roger Federer, Rafael Nadal and Novak Djokovic. No one else since 2004 has won 25 straight matches at tour, tour qualifying or challenger events, according to ATP World Tour stats guru Greg Sharko. Evidently, there are two ways to pull off a 25-match winning streak in tennis today: Be one of the best players of all time, or do what Goffin has done — set yourself an easy schedule and combine it with luck and improved play. Tennis players, unlike, say, NFL teams, can decide which events they play. Goffin and his coach chose ones with relatively weak fields — just nine of Goffin’s 34 wins were against players ranked above him — and now the young Belgian is on a winning run usually only experienced by the game’s very best. Winning brings ranking points, which means easier draws. It also brings money, which can be invested in coaches, physical trainers and more comfortable travel. The downside of winning is that it leaves little time for rest and for major work in practice. And if it comes against easy opponents, it may not provide useful preparation for tougher ones. But there are psychological advantages to winning. “You don’t doubt, you just attack every ball and then you are sure the ball will be in the court. It’s a great feeling,” Goffin said. Before his recent run, Goffin had been most famous for his losses. He made his Grand Slam debut as a lucky loser, snagging a spot in the draw despite losing in the last round of qualifying. He parlayed that berth in the 2012 French Open into a fourth-round loss to Federer, his childhood idol, and attained fame for smiling through an on-court interview afterward with the man whose face adorned posters on Goffin’s childhood bedroom walls. Goffin’s later Grand Slam losses also were to top players: Six of nine came to players seeded in the Top 10, four of those in the first round. The lucky loser had become an unlucky loser. Goffin sensed he was improving before his results did. In March of this year he started working with his current coach, Thierry van Cleemput, and began enjoying tennis again, shedding the defensiveness and doubtfulness that had plagued his game. But he kept running into tough competition, culminating with what van Cleemput called a “nightmare” of a draw in Wimbledon, against defending champion Andy Murray in the first round. Goffin and his coach decided it was time to step down a level. As most of the tour’s top players either rested after Wimbledon or moved to hard courts to prepare for the U.S. Open, Goffin stayed in Europe, on clay, entering a tournament in each week of July: three challengers — a rung below tour level — and one at the bottom level of the tour. He won all four tournaments. (Up until then, he had never won more than eight straight matches.) Then he came to the U.S. and won seven of nine matches — taking a set 6-0 off No. 8 Grigor Dimitrov. Back in Europe, he won seven straight matches, to send Belgium back to the top level of the Davis Cup and to win his second career title, again at the bottom level of the tour. “We decided to play some challengers to try to win some matches and to get some confidence,” Goffin said. “The level was there in practice and against Murray, but what I needed was to win some matches and to play a lot of matches.” He added, “I didn’t expect to win so many matches.” After all, he hadn’t made it past the quarterfinals of the four prior challengers he’d played this year. Recent tennis history supports the coach’s caution. 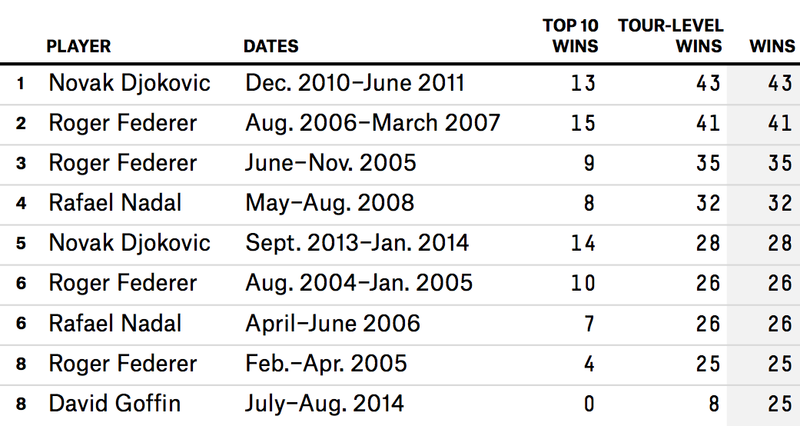 Federer, Nadal and Djokovic didn’t play any challengers during their 25-match winning streaks. Much less familiar names precede Goffin’s on the list of players to win three straight challengers in the past 10 years. None has ever been ranked in the Top 30. 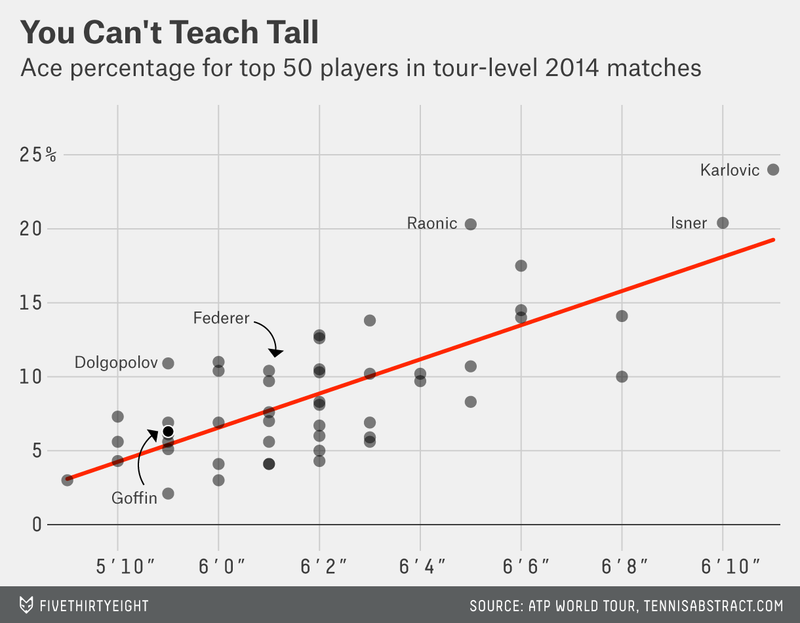 It’s not only luck and easy opposition that has propelled Goffin to new heights. It’s also his serve. He hit aces on more than one in nine service points in eight of his 14 tour-level matches on hard courts this summer. He’d done that in just three of 50 prior hard-court matches at that level. It’s a remarkable feat for a player who is 5’11.” Height translates into the ability to hit at a sharper downward angle without the net getting in the way, which makes it easier to hit serves that are both fast and in the box. 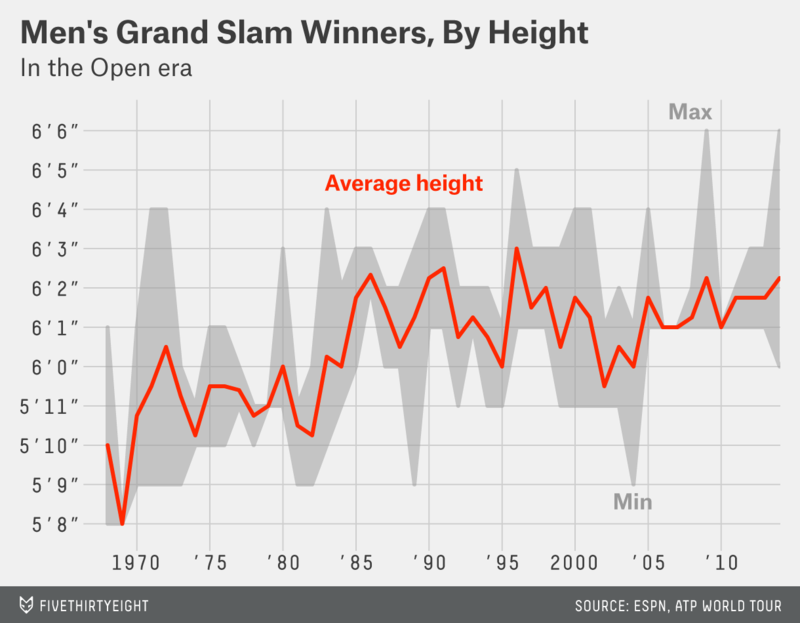 No one under 6′ has won a Grand Slam title in the past decade. Dolgopolov, the tour’s best sub-6-foot server, raises his contact point by leaping into the air. Goffin’s service motion is striking for how little he gets off the ground. Van Cleemput said his main intervention was to change Goffin’s toss and to emphasize the follow-through. Van Cleemput wants to get Goffin leaping higher on his serve, and to improve his strength and fitness. But when his player keeps playing events late into each week, he doesn’t get much time to work with him. For now, most of Goffin’s practice sessions are live matches. Goffin is confident he’ll have plenty of chances to work on his game and to keep getting better. “I have a lot of years in the future to do some good things,” he said — though he may never do anything as good as his unbeaten late-summer run.